Census-designated place in Hawaii, U.S.
For the town in Oahu, see Kailua, Honolulu County, Hawaii. 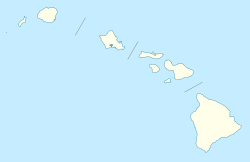 Kailua is an unincorporated city (Census Designated Place) in Hawaiʻi County, Hawaii, United States, in the North Kona District of the Island of Hawaiʻi. The population was 11,975 at the 2010 census,  up from 9,870 at the 2000 census. It is the center of commerce and of the tourist industry on West Hawaiʻi. Its post office is designated Kailua-Kona  to differentiate it from Kailua located on the windward side of Oʻahu island, and it is sometimes referred to as Kona in everyday speech. The city is served by Kona International Airport, located just to the north in the adjacent Kalaoa CDP. 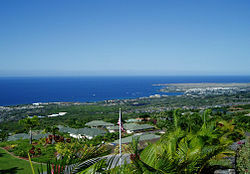 Kailua-Kona was the closest major settlement to the epicenter of the 2006 Kiholo Bay earthquake. The community was established by King Kamehameha I to be his seat of government when he was chief of Kona before he consolidated rule of the archipelago in 1795. It was later designated as the capital of the newly unified Kingdom of Hawaiʻi. The capital was later moved to Lāhainā, and then to Honolulu. Royal fishponds at Kaloko-Honokōhau National Historical Park were the hub of unified Hawaiian culture. The town later functioned as a retreat of the Hawaiian royal family. Up until the late 1900s, Kailua-Kona was primarily a small fishing village. :58 In the late 20th and early 21st centuries, the region has undergone a real estate and construction boom fueled by tourism and investment. Kailua-Kona is bordered to the north by Kalaoa, to the south by Holualoa, and to the west by the Pacific Ocean from Kailua Bay in the south to Honokohau Bay in the north. The Kailua-Kona postal code is 96740 (post office boxes – 96745). As of the census  of 2000, there were 9,870 people, 3,537 households, and 2,429 families residing in the City. The population density was 278.0 people per square mile (107.3/km²). There were 4,322 housing units at an average density of 121.7 per square mile (47.0/km²). The racial makeup of the City was 38.7% White, 0.5% Black or African American, 0.5% Native American, 18.3% Asian, 13.2% Pacific Islander, 1.9% from other races, and 27.07% from two or more races. 10.2% of the population were Hispanic or Latino of any race. There were 3,537 households out of which 35.0% have children under the age of 18 living with them, 49.6% were married couples living together, 13.6% had a female householder with no husband present, and 31.3% were non-families. 22.6% of all households were made up of individuals and 7.2% had someone living alone who was 65 years of age or older. The average household size was 2.78 and the average family size was 3.26. In the City the population was spread out with 27.3% under the age of 18, 9.0% from 18 to 24, 28.8% from 25 to 44, 24.9% from 45 to 64, and 10.0% who were 65 years of age or older. The median age was 36 years. For every 100 females, there were 98.8 males. For every 100 females age 18 and over, there were 95.8 males. The median income for a household in the City was $40,874, and the median income for a family was $46,657. Males had a median income of $30,353 versus $26,471 for females. The per capita income for the CDP was $20,624. 10.8% of the population and 6.5% of families were below the poverty line. Out of the total population, 11.9% of those under the age of 18 and 3.9% of those 65 and older were living below the poverty line. Kailua is the start and finish of the annual Ironman World Championship triathlon,  the annual Kona Coffee Festival, and the Hawaiian International Billfish Tournament. Kona coffee is the variety of Coffea arabica cultivated on the slopes of Hualālai and Mauna Loa in the North and South Kona Districts. Ali'i Drive, Kailua's oceanfront downtown street, starts at Kailua Pier. 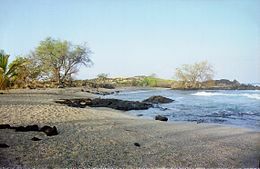 It has also been given the designation as a Hawaii Scenic Byway called the "Royal Footsteps Along the Kona Coast". This byway features archaeological sites that have survived for hundreds of years. North of the pier is the Kamakahonu royal residence and Ahuʻena Heiau. Another royal residence is Huliheʻe Palace, used by members of the Hawaiian royal family until 1914. The Historic Kona Inn and other shops are on the street. Churches on the drive include Mokuaikaua Church, Hawaiʻi's first Christian church built in 1820, Saint Michael the Archangel Catholic Church, and Living Stones Church, a historical structure built after Mokuaikaua and used as a Christian Missionary landing location in the 1800-1900. Parks include La'aloa Bay (also known as Magic Sands or White Sands Beach) and Kahaluʻu Bay, which is a popular snorkeling location. Boat tours which allow tourists to swim with dolphins, watch whales, and fish in the ocean usually depart from Honokohau Harbor. ^ a b "Geographic Identifiers: 2010 Demographic Profile Data (G001): Kailua City (Hawaii County), Hawaii". American Factfinder. U.S. Census Bureau. Retrieved May 30, 2017. ^ " Kalaoa CDP, Hawaii Archived 2009-07-23 at the Wayback Machine." U.S. Census Bureau. Retrieved on May 21, 2009. ^ a b c d Doughty, Andrew. Hawaii the Big Island Revealed: The Ultimate Guidebook, 4th ed. Lihuʻe: Wizard. ISBN 978-0-9717279-4-6. ISBN 0-9717279-4-5. ^ "Station Name: HI KAILUA KONA KE-AHOLE AP". National Oceanic and Atmospheric Administration. Retrieved 2013-04-02. ^ "Monthly Normals Kailua Kona Int'l AP, Hawaii". WRCC/NCDC. Retrieved August 31, 2011. ^ "Hawaii's Big Island economy improving despite tourism slowdown". Pacific Business News. 26 September 2014. Retrieved 3 January 2015. ^ Gill, Lorin (August 25, 2015). "University of Hawaii's New $27M Kona campus begins first classes". Pacific Business News. Retrieved April 16, 2019. ^ "Palamanui may offer marine science degree". West Hawaii Today. Retrieved 3 January 2015. ^ "UH heads lay out vision for Hawaii Community College — Palamanui". West Hawaii Today. Retrieved 3 January 2015. ^ Armstrong, Jason (January 2, 2019). "Big Island: The VOG I Gone - For The First Time in Decades". Civil Beat. Retrieved April 16, 2019. ^ "Ironman World championships". Ironman.com. Retrieved 2016-05-22. ^ "Official website". West Hawaii Today. Retrieved June 13, 2015. ^ " Kailua CDP, Hawaii Archived 2009-06-04 at the Wayback Machine." U.S. Census Bureau. Retrieved on May 21, 2009. 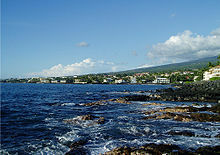 Wikimedia Commons has media related to Kailua-Kona, Hawaii. Wikivoyage has a travel guide for Kailua-Kona.